I received quite an interesting update last night from the people at Cool Mini or Not regarding their recent Kickstarter campaign, the World of Smog. It refers specifically to “The Embassy”, a three chapter campaign that is a Kickstarter exclusive. Have a read of the update below. Gentlemen, the campaign might be over but there is still so much to talk about! Today we will be continuing the “Look Into” Series with a look into (surprise surprise) The Embassy! In this exciting expansion for The World of SMOG: Rise of Moloch, the intrepid Gentlemen are sent to investigate strange events surrounding the mysterious Embassy. The Embassy brings an all new three Chapter campaign to Rise of Moloch, beginning with a daring escape from an infected Police Station to the very depths of the London sewer system! But it’s not only the map that has changed in The Embassy, the Nemesis themselves have changed into a new threat! One of the main new features of The Embassy is the removal of Torment Cards, which have been replaced by an all new Mutation Deck. Each Mutation brings unique benefits (or negatives) to the Host. During the Nemesis’ Chaos Activation they will roll a single die. They may then choose any model in play who has a Mutation with the matching symbol and immediately activate them, having full control over their actions. Yes, this means that while the Gents gain power from their new gifts, they are also pulled into the Synaptic Control of The Embassy, meaning they could turn against their companions at any time! This Nemesis is very different from the one trying to bring about the return of Moloch (or the same one just switched allegiances, depending on how you want to view it). Whereas Moloch grants dark sorceries to their followers, The Embassy brings new methods of control and manipulation. While don’t want to spoil too much of the actual Campaign Plot for The Embassy, one of the Campaign Rules includes the fact that one Miss Emma Swanson has gone missing, and cannot be selected for the campaign. The Unicorn Club is of course deeply worried about the status of one of their most prestigious members! Unfortunately for the local police, the Constables have also fallen to infection. Constables are Agents, with the exception that when you activate one, they will all activate. Given their role in the grander plans of The Embassy, they also unfortunately only have 1 version to choose from, but given that it’s based on Mutations, they will seldom play the same. With Charlie you’re going to get a nice area-control model who can also help you control just what Mutations the Gents have at any time (as well as customizing Charlie a bit). Darwin meanwhile is the most versatile of any of the Embassy’s Agents, able to adapt to any situation on the fly depending on your evolutionary means! Kenny here is the first Agent the Gents will encounter- don’t take that as meaning he’ll be some sort of push-over! Kenny has two distinct play-styles: his first inspires the mobs of Minions around him to greater feats of violence, his second puts things a bit more in his own hands, granting him major offensive power at the cost of potentially damaging himself. Ambassador Nail here is a slow-moving juggernaut. Aside from that he’ll randomly gain a different boon each activation (well…Unless he rolls a Dodge, anyway), so the Gents will never know just what he’s going to do. His A Side gives him Charge and the ability to knock an enemy away when he damages them (which, consequently, would allow him to Charge them again, if he has the Ether). His B side gives him a devastating Area of Effect attack, allowing him to punish groups of Gentlemen who decide to go and team up against him. Lord Swanson does not mess around. He starts with two Mutations and can cycle through ones as he needs. His A Side grants him Synaptic Backlash, meaning he can single out one Gent and make their life hell. His B Side just makes things difficult for everyone around him so… Well I guess that’s lose-lose for the Gents, which means a solid Win for the Nemesis! In addition to the Agents and Minions, Lord Baron Mantes and Elisabeth Sparkle join the ranks of the Unicorn Club in this expansion. A brand new set of Tiles and Overlays bring this adventure to life! The miniatures look awesome, and I particularly like the look of Ambassador Nail who reminds me of a fighting machine from War of the Worlds. I had a look at previous updates on the campaign, and apparently it is about 80%. Estimated delivery is 1 year. I have to say, more than many Kickstarters I have backed, I am excited for this one. The Campaign is taking late pledges HERE. 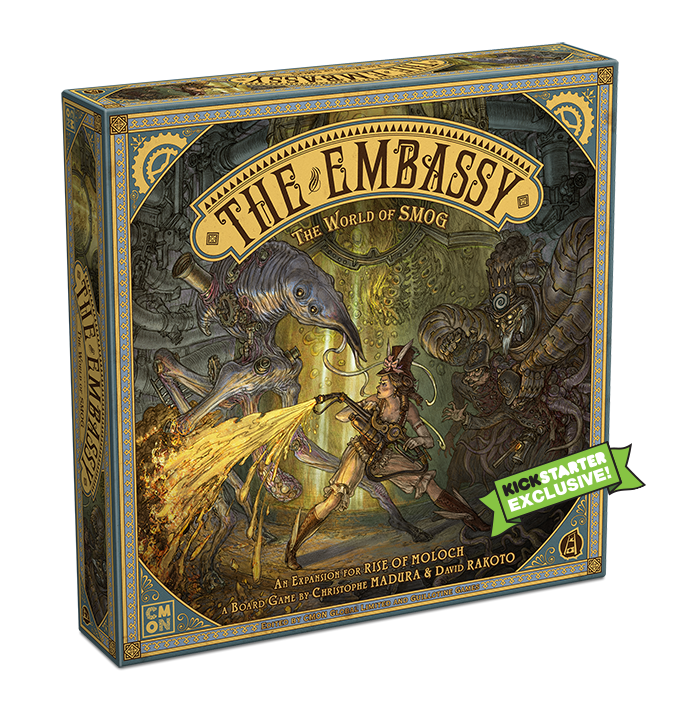 The Embassy Expansion is an additional $20, which for what you are getting looks to be a bargain. I can’t wait to send infected bobbies after my players! Imperium Galactica 2: Alliances – On Steam and GOG!